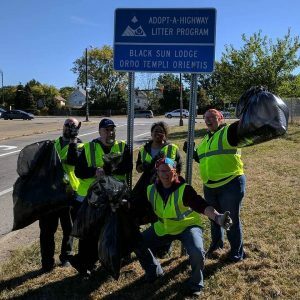 Black Sun Lodge Caring For Their Adopted Highway – Zero Equals Two! “As the Black Sun Lodge Volunteer Committee brainstormed service project ideas, Brother Andrew Lent and I suggested that we perform litter cleanup duties through the Adopt A Highway program. This would provide an opportunity for visibility and service in the area where the Lodge is located. “Each state’s Department of Transportation offers this program. I contacted the Ohio Department of Transportation to apply for the permit. It cost us nothing to complete the paperwork or for the two signs that are placed near the exit ramps. The service that we will provide will enable the state to focus their money on other road projects instead of litter pickup. Meanwhile, Black Sun Lodge have continued to keep up the good work!